How do I choose the width of my macrame curtains and cafe-curtains? The best is to measure your rod where your curtain will be hung. Generally for macrame, you should plan for approximately 20 to 30% extra, it is not like a net curtain, you have to be able to take advantage of the motif. However, if your taste is for more gathered curtains, some of our customers get up to 50% extra. Remember that lighter curtains can gather more easily than curtains with more work to them. How do I choose the height of my macrame curtains and cafe-curtains? Regarding cafe-curtains, it is true that as a general rule, you dress a window with a curtain that will cover either half, 1/3, or 2/3 of the window and possibly placing a reminder of approximately 12 inches on the top if you want to give more finish to the window. But keep in mind, however, that there are no rules: every height is good! The important thing is to dress your window the way you want, that's the advantage of macrame. Yuu can place all heights of cafe-curtains or tier curtain based on the landscape you want to see, or the part of the window you want to block. There are never any errors of taste. With regard to curtains, you can cover the whole window, but here again there are no rules. Keep in mind, however, unlike net curtains, you can hang a macrame curtain that is a bit lower with some daylight at the bottom, and the nice finishings at the bottom will stand out. One tip: you can make a simulation on your window by hanging your rods on your window with tape, for example, in order to see what curtain height you like best. Advice on choosing ecru, natural, white, or colors? "Natural" and "ecru" colors are very understated and very current colors, they go well with wood tones, and we strongly recommend these colors which go weill with most interiors and yield a much more natural look. The white is a "snow" white which requires a manufacture time and additional cost (+15%) to send it out to be dyed. The white color is more vivid and often gives off too much contrast. For your information, all the photos on our site were taken with "Ecru" or "Natural" colors. The "natural white" color is very close to white, it comes close to off-white. "Color" curtains lend themselves more to more contemporary style interiors, ideal if you want to give a bit of brightness to your interior. It is true that ecru or natural colored macrame tends to lighten over time, which can be an advantage for some people who prefer a lighter color, but may be a drawback for others. Advice: For those who want to maintain an ecru color, you can occasionally dye it using a tea bath to regain a more ecru color. 1 to 2 teabags in a half bucket of hot water. What is the difference between cafe curtains and other curtains? Cafe curtains are shorter, they generally take up one third, half, or two third of the window, this depends on the dressing you want for your window. You can also add a booster at the top of the window, this little band is often between 12 and 18 inches tall. Macrame curtains are larger and generally cover the entire window, you can let them finish at the window frame, or a bit lower: finishings stand out from the inside, or a bit shorter: finishings then stand out from the outside. How do I choose my macrame lace model based on brightness? As the manufacturer, we have a wide range of macrame curtains, from lighter ones to those with more work. We invite you to read the descriptions of the different models well. In order to give you additional assistance in choosing your model, here is a list of each macrame curtain in our collection, sorted from lightest to most concealing: Printemps, Pâquerettes, Laura, Fleur de Lys, Feuilles, Amaryllis, fruits, Floral, Victoria, Valentine, Ecureuils, Mimosas, Annie, Tradition, Classic, Tulipe, Harmonie, Venise. What model of curtain should I choose based on my decorating style? Macrame lace curtains with a blend of polyester and cotton in the ecru color give an enormous amount of style, they harmonize perfectly with a rustic style and with stained wood furniture: oak, cherry, etc. This is the case for Tradition, Fleur de Lys and the Annie brise-bise curtain. Colored macrame curtains bring a great deal of freshness, they integrate completely with your kitchen, for example, as well as any other room in the house. Our colors are close to pastel tones, which helps to blend them with many colors already found in your home. Do macrame curtains let light through? Yes, and often even more than a net curtain. Some curtains are lighter than others, refer to our list: How do I choose my macrame model? Can people see inside my house through macrame curtains? No, macrame curtains have the distinctive feature of being as lovely from the outside as from the inside. And so, from the outside, unlike a single net curtain, even for lighter curtains, it is the beauty of the motif that shows through the window, and not the inside of your house. What rods can I use? 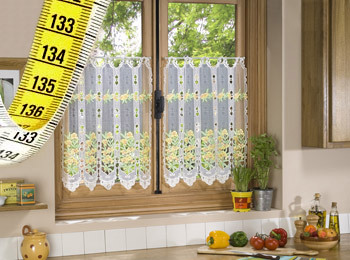 All our models of macrame curtains and cafe curtains can be used with a rod up to 0.8 to 1.2 inches in diameter. Generally, all rods sold in home supply stores will fit our curtains. By special request, we can make you large, 1.6 inches diameter rings for your curtains that will fit large rods. Contact us, or mention it when placing your oder, a field is provided for this purpose. What length of tiebacks should I choose? The length of the tieback depend most on your own taste. It can be short enough to tie the curtain in order to let in daylight and expose the landscape. It can be rather long in order to cover a bit more of the window, thus maintaining the privacy of your home. In all cases, macrame tiebacks, thanks to the openwork construction, can be adjusted based on the tightening you want to have, you can just let the extra hang to the side. Don't forget to plan for a bit for the attachment on the side of the window. Remember, a 40 inches long tieback will be 20 inches long once in place since it is folded in half. All our curtain models are sold individually except for looped curtains (tieback curtains) which are listed as "per pair." Curtains are ready to hang, do they need a hem? All our curtains and cafe curtains are ready to hang, no hems are needed. All our models are made to enable a rod to pass through your curtain. You can even cut through the motifs without them fraying.